A new Hummingbird joins the flock! 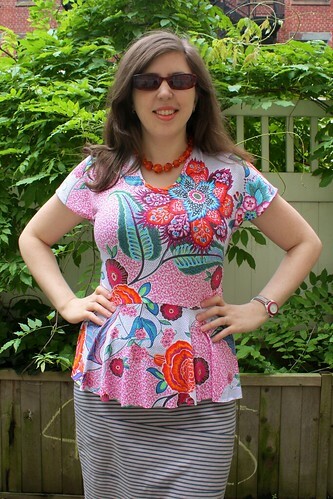 So the moment I saw this hummingbird-colored fabric, I just knew it had to be my second Hummingbird peplum top, to follow my first black & white version. 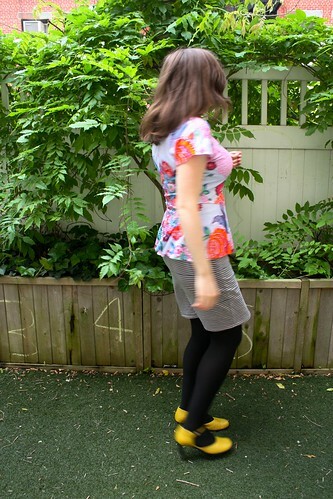 In fact, most of the time involved for this super-quick sewing project was in the cutting—I had to work REALLY carefully to make sure that none of the little round flower things ended up over either "bust apex." 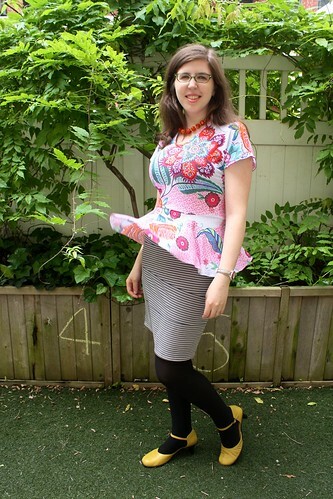 The pattern: Cake Patterns Hummingbird Peplum Top and Straight Skirt 0289. (Hummingbird is shipping now in paper, by the way, or you can buy the top-only PDF for instant peplum gratification). Fabric: Soft, stretchy and super light-weight rayon/spandex blend jersey from Mood. (I bought extra because I knew the large-scale print would be a challenge.) It doesn't have quite as crisp of a drape as my previous fabric, so the four-leaf clover effect is a bit lost. Also, this fabric is so bright, it is scientifically impossible to be unhappy while wrapped in it. I used the second sized peplum length to make it a more comfortable top over jeans or any bottoms that don't sit at the natural waist. I like both lengths on me, however. Since this fabric is so light and fluttery, I finished the sleeves with a magenta rolled hem edge on my serger for variation. 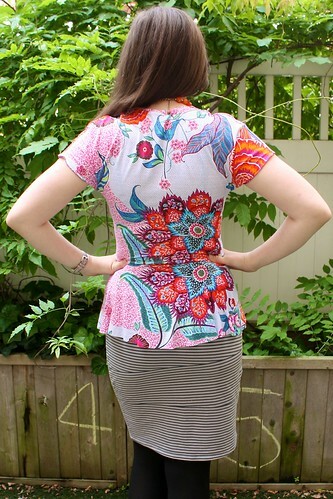 I shortened the back by a little over an inch around bust level (because the top length is sized by front waist length, you may need to do this if you are quite full-busted). I don't think I've ever really managed this before. The key was to stretch the band quite a bit tauter over the most curved areas, and just moderately over the straighter areas (Threads has a fantastic video on this from Sarah Veblen, and this one is pretty great too). The topstitching Steph recommends in the instructions helps a lot as well—I did mine in pink. I'm also pleased with myself for once again getting out of the apartment for a photoshoot—this time the courtyard of my apartment building. (I did worry that the neighbors were wondering what I was doing out there by myself with a tripod twirling around, but oh well.) No idea what those chalked numbers are there for. Honestly, I feel like this neckband trick is life-changing. I have never really gotten any knit neck bindings to properly cooperate before—they tend to ripple and sag and wibble and wobble all over the place, which is one of the reasons I have made the Jalie scarf-collar top twice—no binding necessary. In fact, I went to see the Star Trek movie with my husband last night and had trouble concentrating on the film because I kept touching my neckband to see if it was still lying flat and crisp—which it was. What's your favorite tip for taming knits? P.S. Full disclosure again, in case you've missed the million times I've mentioned it: I'm the envelope illustrator for Cake but I am NOT paid to sew or blog about Cake! CUTE! 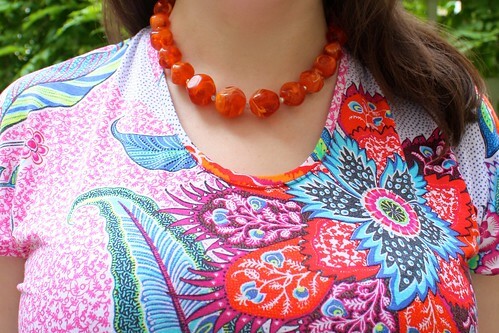 I love this bright top-- it's so cheery and fun! That neckband really looks great! You did a fantastic job and the print is placed well. Beautiful! I love this version, the fabric is so pretty and you did a great job with it! Yaaay! The movie was... acceptable. Great acting, great characters. BUT. Missing all the stuff that makes Star Trek awesome—the wonderful nerdy cerebral technobabble stuff. It was 90 percent action and guns and terrorism and blowing things up. This is such pretty fabric! Very happy. Your neckline looks fantastic - I have yet to master this skill. Just watch those videos, I swear it all becomes clear! The other thing that helped was basting it in after pinning... just to make SURE it was flat before I serged it. Thank you everyone for the super-sweet feedback on my top! Va,va,voom! This is gorgeous and you look amazing in it! This is wonderful and beautiful! Congrats on the neckbinding. I'm always so excited when that turns out well too. Love that fabric! What a find. And thank you for the links to the neckband-sewing videos. I've sewn some knit neckbands fairly successfully, but those techniques will save time and they look foolproof. Always something new to learn. This is very cute! The fabric is beautiful. Good job with the neckband. I totally understand being self-conscious about people looking on while you move around in front of a tripod. Haha! Thanks for the links to the video, that was so clear. 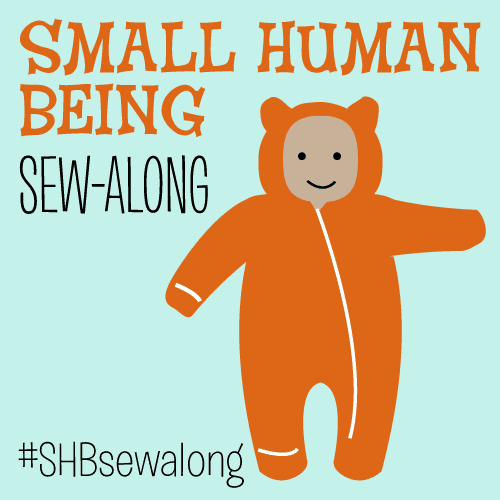 Now I'm feeling inspired to sew some knit shirts! Beautiful! I am seriously considering this pattern, which is why I am lurking on your site. I also love your illustrations! !